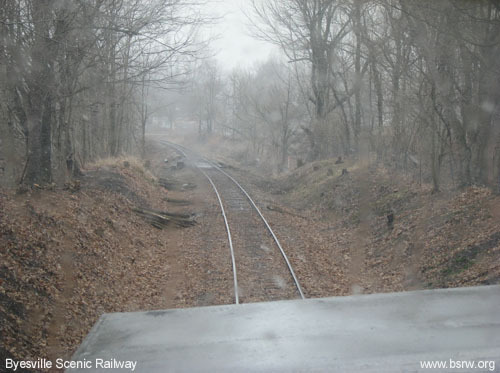 On Saturday March 22nd 2008 we operated our train for the first time beyond our usual destination of Derwent, OH. 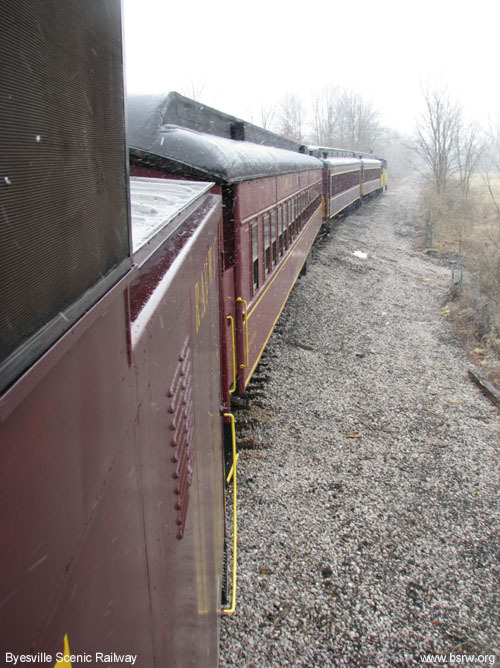 We continued southward on the old Pennsylvania Railroad's "Marietta Branch" to "C&M Crossing", near Pleasant City. 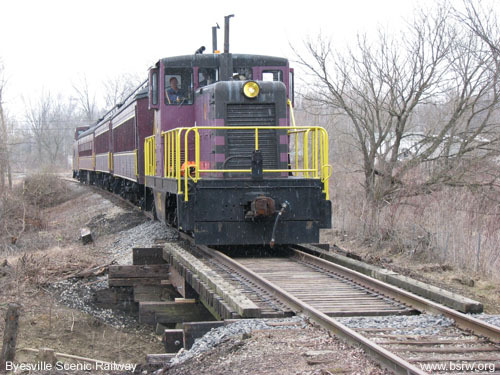 At C&M Crossing we turned west on the old Baltimore & Ohio Railroad's "Eastern Ohio Branch", traveling to the State Route 821 crossing. 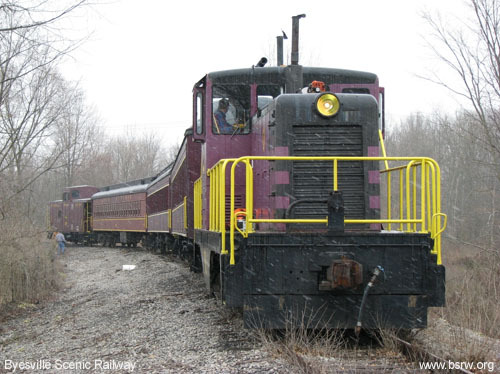 The last train to operate over this line was almost 15 years earlier in October 1993, after which the line fell into a state of disrepair, and trees and brush began to reclaim the right-of-way. This segment of rail line had been heavily damaged during the "Flood of the Century" in June 1998, and was damaged even further during another heavy flood in September 2004. 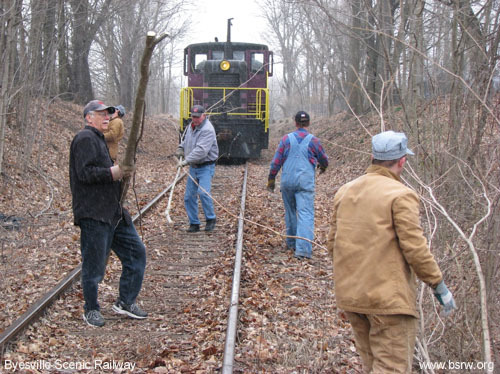 From years 2004 to 2008 our volunteers dedicated many hours to clearing trees and brush, repairing washouts, and replacing old cross ties to bring the line back to operating condition. 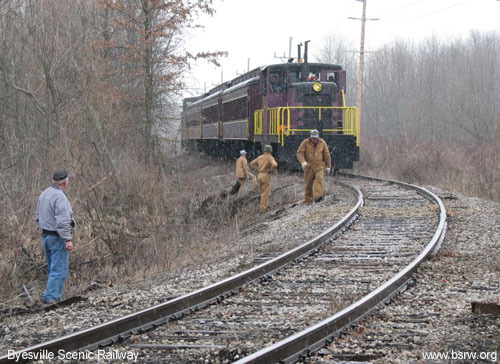 The Ohio Central Railroad also made structural repairs to a small wooden trestle south of Derwent. In the summer of 2008 we started operating regularly over this new section of track, increasing our mileage to 9 miles round trip. 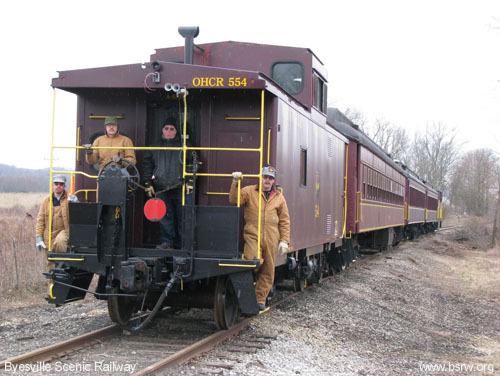 We plan to eventually re-build the entire railroad all the way to Cumberland, OH. 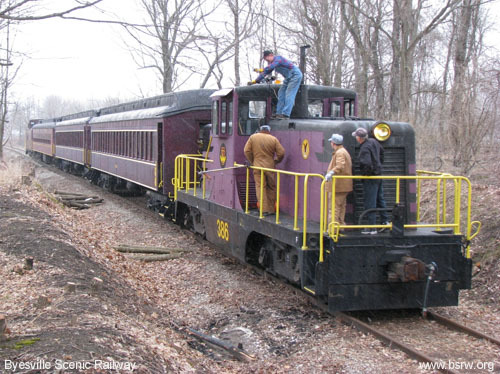 Once completed, our excursion will be 25 miles round-trip. 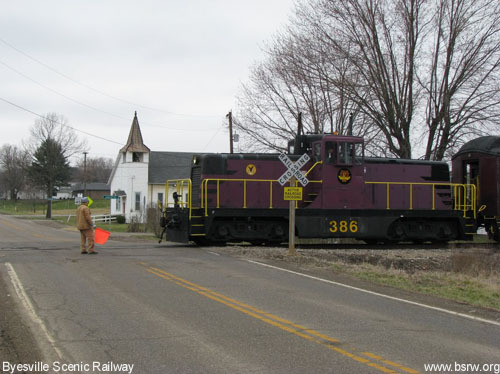 Our train running south of Derwent for the first time, shown crossing State Route 313. 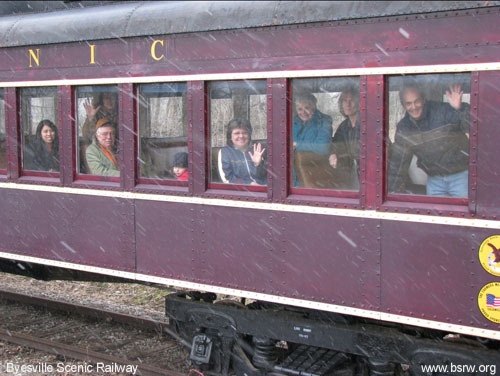 Byesville Scenic train southbound at Derwent. 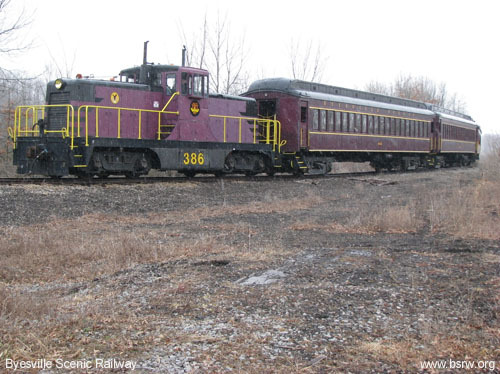 This is the old Pennsylvania Railroad's "Marietta Branch". Crossing over "Bridge No. 82", a wooden trestle south of SR 313. Clearing small branches overhead from along the right-of-way. Some of our volunteers taking in the new route as the snow begins to fall. Clearing small trees from along the right-of-way. Volunteers clearing small trees from along the right-of-way. View from caboose cupola as train continues southbound. 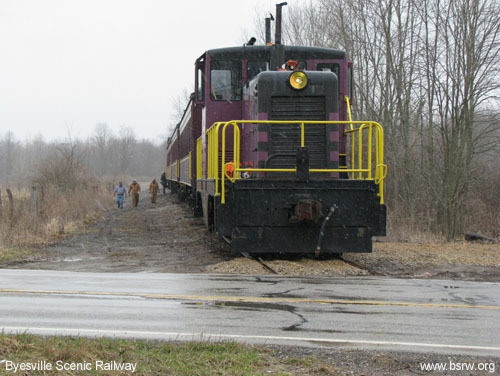 Our train approaching the curve at C&M Crossing for the first time. 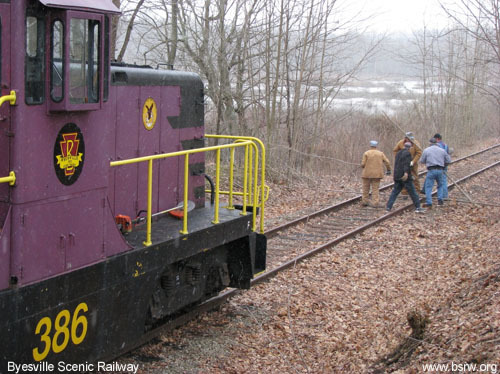 BSRW crew members inspecting wheels as our train enters the curve. 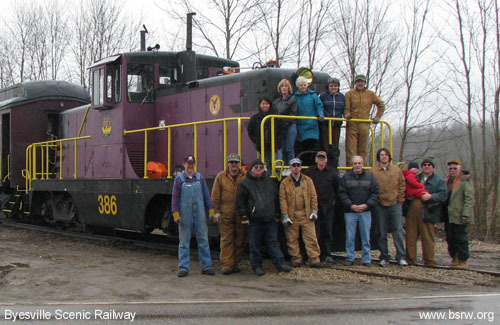 Our train at C&M Crossing. 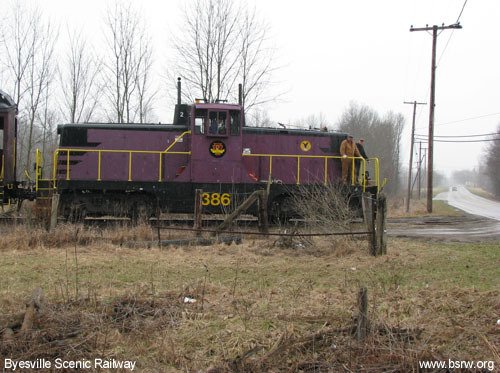 Here the PRR Marietta Branch crossed the B&O Eastern Ohio Branch. The ties of the "diamond" are still visible in the foreground. Our train at C&M Crossing, the engine is now facing westbound towards SR 821. Cumberland, OH is 8 miles to the west of here. 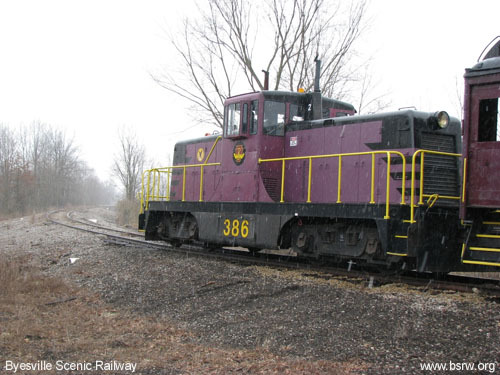 Our engine is now on the old Baltimore & Ohio Railroad's "Eastern Ohio Branch". View from caboose cupola, looking west at C&M Crossing. 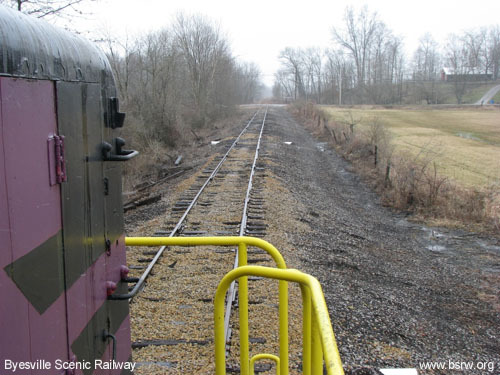 View from locomotive #386, SR 821 crossing is in the distance. Our train at the SR 821 crossing for the first time. C&M crossing is behind the train. 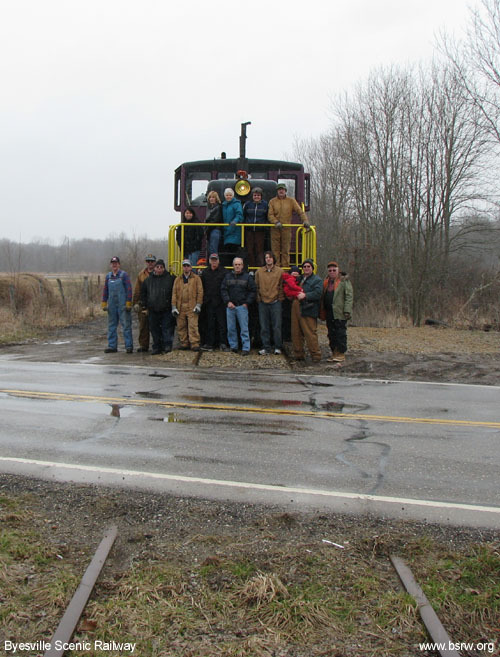 Byesville Scenic Railway crew at SR 821 crossing. BSRW crew at SR 821 Crossing. Eventually this crossing will be rebuilt to allow passage of our train. View of our train at SR 821 crossing, view looking south. Pleasant City is in the distance. 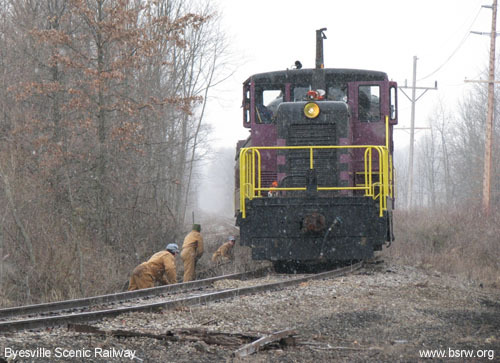 Click here to view photos of our efforts to rebuild this line from Derwent to Cumberland, OH.